All through this process, Linda Osmond, Functional Health Coach and Master T-Tapp Trainer, has been my teacher, mentor. Linda has been there with me showing expertise, compassion and patience. She also was able to help me “nutritionally” with a kidney problem I have. 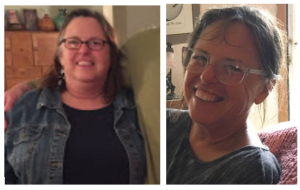 with 53 inch loss, in my first year with Linda’s coaching! reaching my weight goal in March 2018 of losing 90 lbs!!! When I am eating right, I want to T-Tapp and the opposite is true also. but have lost 3.5 lbs the first week and know I will be back at goal for me. I lost another 12.5 inches with Healthy Hormones Menopause Management Workout in a week! I love what T-Tapp and BLE have done for me. even for and especially with those not so young. I have participated in a T-Tapp online group by Linda, to go over form, any questions we had, and to be informed by any “nutritional” needs we had that Linda could help us with. We also each had one individual training session to really go deeper into our own unique needs. I personally benefited greatly from the group. Having done TTapp on and off for several years, almost exclusively HHMM, I wasn’t able to learn about new form, tips, etc, elsewhere. and simply corrections to form that with things that I wasn’t aware I was doing improperly. The changes Linda made greatly increased my activation of lats and generally stepped up my game quite a bit. Highly recommend Linda Osmond and her classes to anyone who wants to progress in T-Tapp. She is a master trainer and her results certainly show it. Very happy!